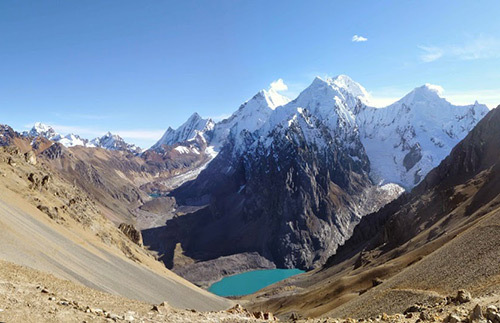 Day 1: Huaraz 3,090 – Llamac 3,300 m.
After the breakfast in hotel, our guide will pick up you then Drive to the village of Llamac and set up our first camp (3300m). 4 to 5 hours drive. We camp near the village football field and can spend the afternoon watching the local kids playing football. Day 2: Llamac - pampa Llamac pass - Jahuacocha 4.100 4.300m. After breakfast at Llamac, about 8: am we start hikin up the pass of Pampa Llamac (4,300 m), from here we can see the the next mountains, Jirishanca, ratsac. 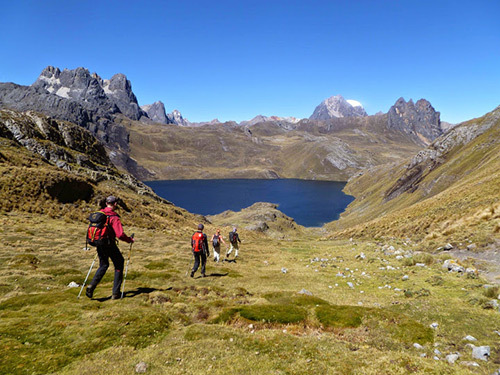 among others then descend toward our second camp Jahuacocha 4.100 m. a spectacular lake great for fishing and landscape of the Cordillera Huayhuash Rondoy Jirishanca yarupaya. approx. 6 - 7 hours. Day 3: Jahuacocha - sambunya pass 4.750 m - Cuartelhuain 4.150 m.
- After breakfast at Jahuacocha, about 8: am we will start climb to the pass sambunya from here we will enjoy splendid mountains of the cordillera huayhuash after to take a picture we go down to cuartelhuain overnight camping. 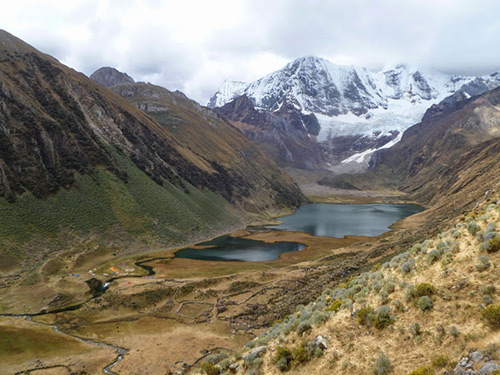 Day 4: cuartelhuain – Cacanan pass 4,750m. – Mitucocha 4,100m. 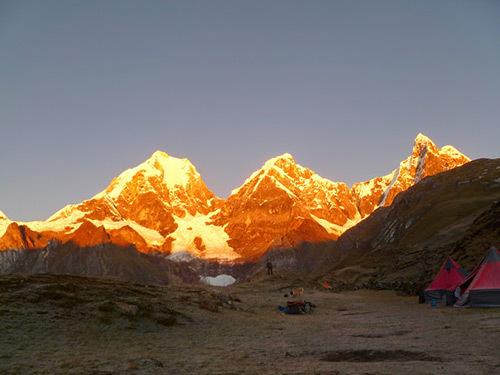 After our breakfast in the camp we will start hiking up to cacanan pass from here we will have beautiful views such as jirishanca, rondoy, chaupijanca, cuncush, after we will go down to mitucocha camp place where we enjoying the beautiful mountains. Day 5: mitucocha 4100m. – carhuac pass 4,650m.- carhuacocha 4200m. This day after the breakfast we start our hiking around 8 hours after 3 hours hiking up we will reach the carhuac pass at 4,600m. enjoying the nice views Yarupaja grande and chico , siula grande ,after continue hiking down to Carhuacocha camp nice views from here. Day 6: carhuacocha 4200m. siula pass 4,800m. – huayhuash 4230m. After the breakfast we will start hiking up along the trail we will see the next lakes Siula lake, Quesillococha lake and Cutacocha lake of different colors after 3 hour half hiking up we will reach the siula pas enjoying the nice views the mountains carnicero,siula grande jirishanca and others after huayhuash camp overnight camping. Day 7: huayhuash 4230m. – portachuelo pass 4650m.- viconga 4350m. After the breakfast we will leave hiking up in 3 hours we will be in portachuelo pass from here we enjoying the next mountains buscanturpa ,trapecio and the cordillera raura leon dormido ,quesillojanca etc, continue go down at hot spring ( take a shower ). This day after to breakfast we willhiking up to cuyoc pass at 5,000 where we can see the next mountains ,cuyoc,siula sarapo, ratsac ,huacrish and the cordillera raura after take a picture we will return to viconga and continue hiking down to pumapampa. Day 9: pumapampa – cajatambo pass 4,450– cajatambo 3,300m. After our breakfast we will start hiking down along the pumarinri valley ,after 3 hours we will be in Cajatambo pass our last pass and last views after rest we will continue go dow to cajatambo small village .